When the world-renowned Palm Jumeirah and its flagship resort, Atlantis - The Palm, unveiled plans for one of the biggest events of the year to celebrate the opening of the resort, they and renowned event designer and producer Colin Cowie turned to Empire Entertainment to help manage the live entertainment and live event components. The three day celebration was attended by over 2,000 celebrity and VIP guests. The grand opening event featured music legend Kylie Minogue's debut performance in the Middle East, a performance by Nawal Al Zoghbi - one of the highest selling Arab artists of all time, Bollywood Superstar Priyanka Chopra, and dinner hosted by Nobu Matsuhisa, Santi Santamaria, Michel Rostang and Giorgio Locatelli. 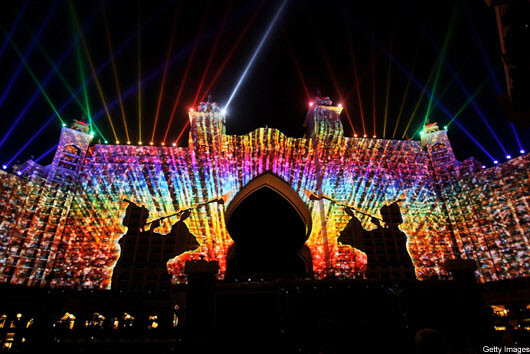 The finalé of the grand opening event was a 22 minute 'Illumination Sequence" featuring an originally-designed video projection across the entire facade of the Atlantis produced by industry veterans Edd Griles and Chip Rachlin. The powerful video projections, which told the story of the Atlantis, were integrated with an installation of high powered Syncrolites and pyrotechnic effects above and beneath the building. At the end of the Illumination sequence, Bollywood star Priyanka Chopra emerged on stage to unleash the world's largest-ever fireworks display - over 7 times larger than those seem at the Beijing Olympic Games - designed and executed by the world famous Grucci Family. 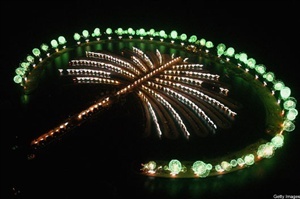 The fireworks spectacular was executed over the Palm Islands' 43 KM of shoreline, illuminating the entire island with more than 100,000 specially designed pyrotechnic devices. The grand opening evening's event was attended by a host of notable names including His Highness Sheik Maktoum Bin Mohammed Bin Rashid Al Maktoum, Charlize Theron, Michael Jordan, Robert DeNiro, Janet Jackson, Preity Zinta, Lily Allen, The Duchess of York, Agyness Deyn, Gerard Butler, Boris Becker, Petra Nemcova, Richard Branson, Lindsay Lohan, Mary Kate Olsen, Mischa Barton, Bipasha Basu, John Abraham, Rani Mukherjee, Gosha Kutsenko, Ronnie Woods and many others from all corners of the globe. DJ Donna D'Cruz of Rasa Music helmed the turntables for the cocktail party. For this immense undertaking, Empire served as talent producer and talent logistics supervisor which included coordinating and integrating the participation of live talent such as Kylie Minogue, local musicians and dancers, Nawal Al Zoghbi, Priyanka Chopra, and DJ Donna D'Cruz. Empire also developed and managed the run of the show and stage-managed the live event including triggering the fireworks display. 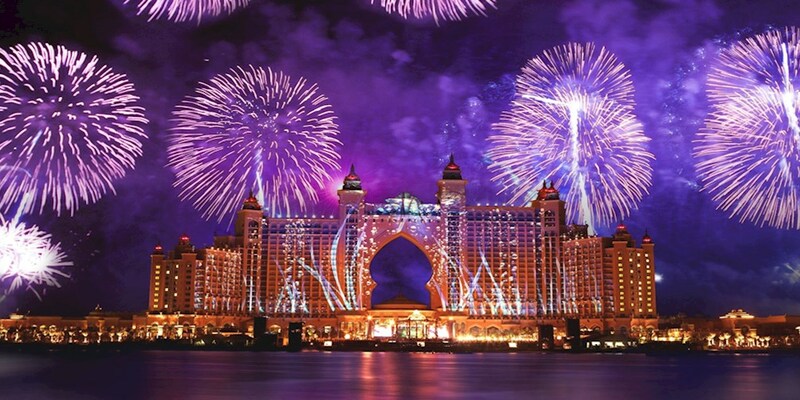 The event was broadcast globally via satellite into over 700 million households with the images of the Palm Island fireworks seen by over 1 billion people. Video highlights of the event can be seen by clicking here. Empire is a leading producer of entertainment for some of the highest stature events in the world and is often engaged by leading event designer & producers like Colin Cowie Lifestyle for our expertise in delivering and managing large scale, live entertainment components for the most demanding projects.